Goblin Haberdasher, from Unstable, absolutely broke my card evaluation process when it comes to cards like this. What do I mean? Benalish Marshal is wearing a helmet, and helmets count as hats for the Haberdasher’s purposes. As an aside, this is the reason I use Goblin Haberdasher in a Boros deck for Filth Casserole – the Legion is associated equally with aggro decks and headgear. If you guys would like to see it, I’ll put together an article about it! The fact is, though, Benalish Marshal doesn’t need to have menace to be a good card. Being able to be hit by Lightning Strike is not usually a quality we prize in Glorious Anthem variants, but attacking for damage is. He’s much more “live” than a conventional Anthem when you draw him after a Wrath of God effect, and there’s probably some kind of deck out there involving Theros’ devotion cards. I haven’t seen too many Commander decks led by Heliod recently, but the Marshal seems like a great fit for such a deck. In Standard, he’s been rather overshadowed by Goblin Chainwhirler and even Tempest Djinn to a certain extent, but he adds an interesting option to white aggro decks in any format (especially in casual settings). Anthem effects are always a nice thing to have on hand, and Benalish Marshal offers several upsides (and downsides) through being a creature. That mana cost is a bit of an inconvenience, particularly since mono-white is not the format’s best deck (unlike Goblin Chainwhirler, part of the cycle with Benalish Marshal)…but given how wide white likes to go, this can represent a massive stat boost in a single body that also can get there on its own (a 3/3 for 3 isn’t ideal, but it’s always been at least playable). 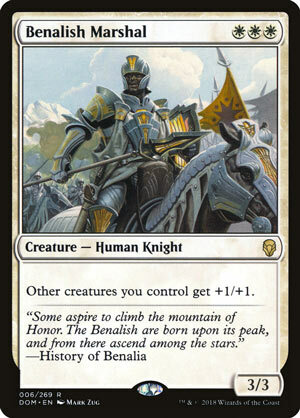 Benalish Marshal has a home in a white deck and among Knight tribal; it’s not an all-star, but it does the job well.